“Enjoy Mexico!” That’s what four shirtless truck drivers shouted at us with huge smiles on their faces when we walked pass a roughly 20 truck long barricade they put up on the main road going from the coast to inland Oaxaca or further on to Chiapas. It was 30°C under direct sun, I had less than 4 euros in pesos on me, still 300 km to my destination and I just got off the bus that had been trapped between two protest barricades for eight hours already. At 8am we were still alive, nobody was robbed, but nobody was moving either. Our bus was standing still in a huge line of cars, trucks and other buses. Someone said there was a block a bit further down the road, as a sign of protest against the government, which had arrested a cartel leader the evening before. I found out later it wasn’t a cartel leader, they imprisoned a trade union’s secretary of finance, who was also a “delincuente,” accused of a mass murder. A British girl and I walked to the barricade; there were four big trucks parked next to each other, making it impossible to pass in either direction. Great. Walking back to the bus we heard rumours that the block might take at least another day, maybe even two. The bus drivers said we couldn’t move anywhere – we were trapped between two barricades. Our bus ride to Oaxaca was stopped with this block on the road Puerto Escondido – Salina Cruz. 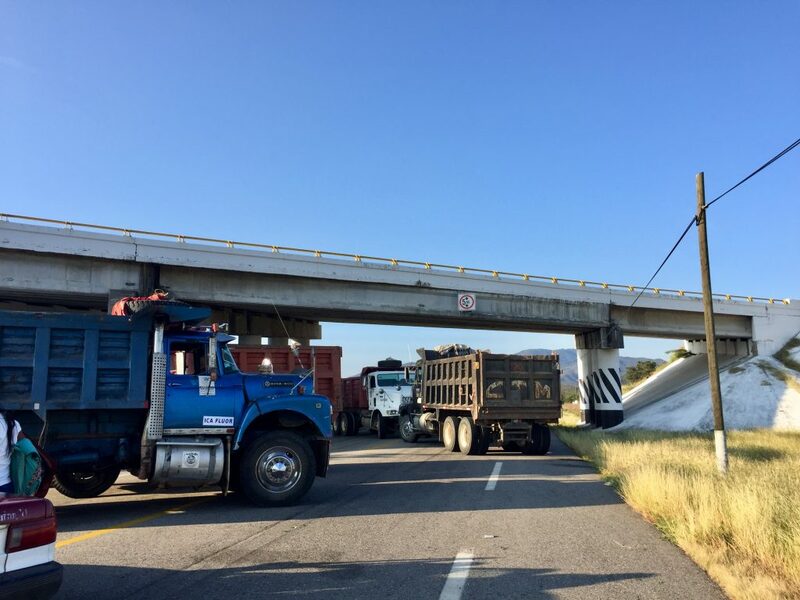 Members of the Confederation of Mexican Workers (CTM) trade union paralysed the state’s capital, Oaxaca, with 20 blocks at different points of access to the city and the interior of the state. All the Mexicans from our bus left. 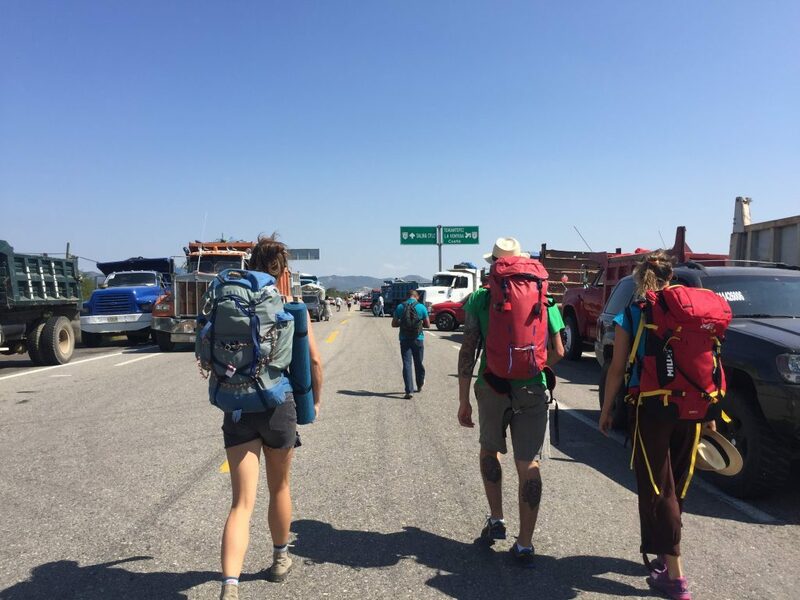 They grabbed their bags and headed down the road; their plan was to walk through the first barricade and take a taxi on the other side (those vultures were standing in line to take people to the next barricade for good money). Us foreigners, we stayed. We were sitting in the shade of the bus, some reading, some eating, some nervously walking up and down. We were supposed to be in Oaxaca two hours ago and now we weren’t even halfway there. An Italian couple asked if anyone wants to join them in trying to make it to Oaxaca the same way the locals are. Walking around the barricade, getting a taxi or a colectivo (a public transportation van, usually cheaper than the bus) to the other barricade, walking around it, getting a new taxi and so on. There goes my bus ride to Oaxaca. On the map it seemed like another 8 hours of driving. My situation was not peachy: I only had 80 pesos in cash with me, which would maybe buy me lunch and some water if I stayed in that road block, so I wanted to get to an ATM asap. And to Oaxaca too, of course. I was up for joining the Italians right away, another Dutch girl as well. The British one said she’s staying at the bus, as she will not pay taxi drivers enormous amounts of money because some truck drivers are inconveniencing her*(1). An American guy was indecisive: “I have two questions. First of all, what are we going to do if we don’t find a taxi on the other side of the barricade somewhere mid-way to Oaxaca?” I guess we all thought about it for a brief second, but I was the only one to answer: “You know who can deal with this problem best? Future you.” Now, he either wasn’t a How I met your mother fan to understand the reference or he was just very boring because this was “not the answer he was looking for”. But then again, he also believed there are drug cartel members all around us guarding the barricade 300 meters away with guns. We didn’t stay for his second question. We passed the first barricade! There were at least five times as many trucks as in the morning blocking the road, so obviously the thing wasn’t getting smaller. Once we started queuing for a taxi, a girl and a guy our age in a blue Nissan qashqai showed up, opened their back trunk and told us they will give us a ride to Salina Cruz, the nearest town. Only when we were already in the air-conditioned car we asked how much it will cost us. “As much as you want to give,” the girl said and turned the music even louder. Well that started off well! Bus ride to Oaxaca: Passing the first barricade. Taxis and cheap vans waiting on the other side to take us to the closest city. We were in a colectivo (the only foreigners, with another eight Mexicans), heading from Salina Cruz to Oaxaca! Our driver said there are at least four road blocks in the next 270 km to the state capital, but he knew how to avoid two around Salina Cruz. Avoiding meant going on dirt roads with a lot of bumps, around bushes, crosssing fields. But hey, what an adventure! I even saw a cow eating a black trash bag in the middle of the bushes. True story. Bus ride to Oaxaca: We weren’t the only ones who knew how to avoid the barricades crossing fields. Three hours into our ride and no barricades. It seemed too good to be true, so somewhere in the middle of the mountains close to Cerro Sacamecate we stopped again. But wowza, we had a well connected driver! He knew a guy who knew a guy on the other side of the barricade with an empty van, who can take us further. Perfect! 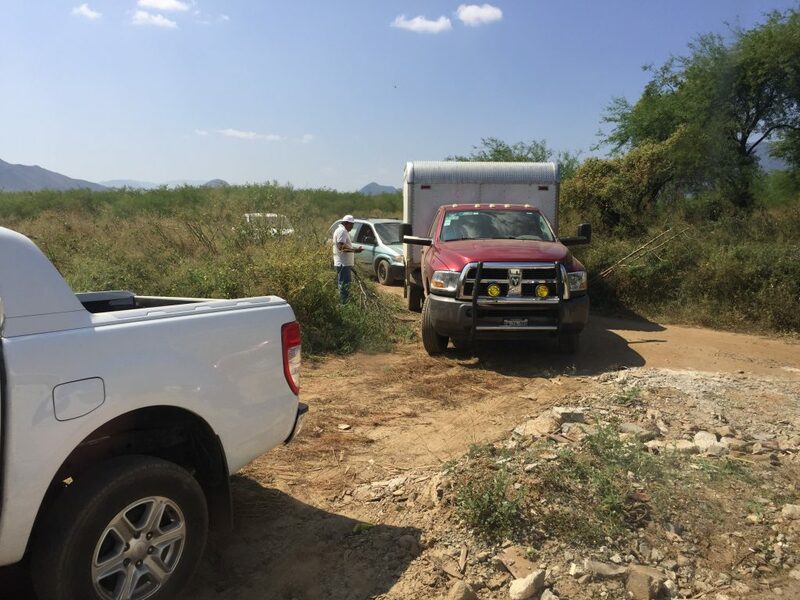 So we got out, walked a few hundred meters with our gringo backpacks, passing the protesters (farmers this time), got to another van and – wooosh towards Oaxaca! At that point we thought of the American guy from the bus: is he still there, sitting on the hot asphalt road, asking his second question? 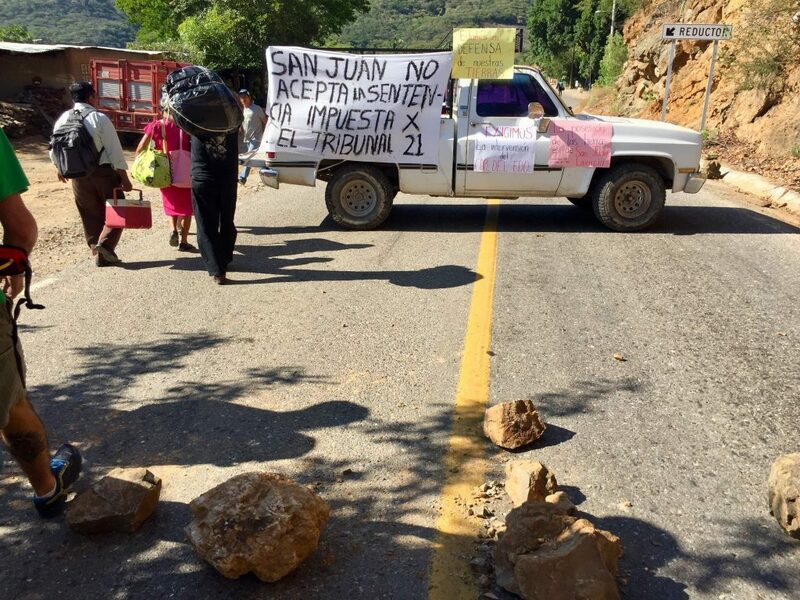 Bus ride to Oaxaca: In San Juan Lajarcia farmers were protesting against the arrest of the finance secretary. We were the happiest bunnies in the world, everybody in that colectivo van. There seemed to be only one more barricade, just before Oaxaca city, but we were getting there! Though, it still wasn’t peachy: we were tired after a night of almost no sleep on the bus, it was hot, we were smelly and sticky and there was an annoying beep going on every three seconds in that colectivo. And we were hungry. I hadn’t eaten much that day: I had a tiny doughnut at 2.30am, then four chocolate cookies at 8am, a very dry tostada the Dutch girl offered to me at 10am, and some cacahuetes garrapiñados (caramelized peanuts) at 1pm. We stopped at the side of the mountain road for the worst pollo and queso tortilla I had in my entire life and that made it a tiny bit better. After 22 hours of traveling, we made it to Oaxaca! I took the mother of all showers, as my friend Ricky would say, had pasta carbonara for dinner and passed out in the second most comfortable bed in the world (right after my Brussels bed). In your faces, four shirtless truck drivers who shouted “Enjoy Mexico!” at us with huge smiles on their faces earlier that day! This makes for one good story! We’re loving Mexico! Later that evening, after 16 hours of blockades, trade unions began gradually removing the barricades on roads in Oaxaca. You can read about it here and here (only in Spanish though). *(1) It wasn’t an enormous amount; we paid 190 pesos (less than 9 euros) for a colectivo ride from Salina Cruz to Oaxaca each.